I began practising Yoga in 2000 and fell in love with it from my first class. I loved the way practising Yoga postures and being aware of my breath released tension from the body and, in turn, brought deep relaxation and peace of mind. 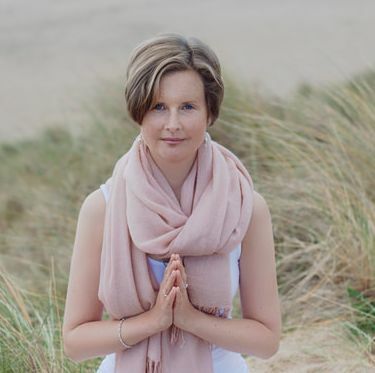 Through my yoga practice and studies as a massage therapist and aromatherapist, I came to recognise the connection between the body, mind and spirit and our inter-connectedness with the universal energy. In 2005 I decided to deepen my knowledge and experience of Yoga by undertaking teacher training in the Elbowroom, Dublin with Anthony Kearney, Lisa Wilkinson and Jaananda. I completed a 200 hour Yoga Alliance Accredited Teacher Training course and hold a Diploma from the Yoga Alliance. In 2006 I went on to study Perinatal Yoga with Uma Dinsmore-Tuli through the Birthlight Foundation. In 2011 I completed a 100 hour Anusara Yoga Immersion with I Love Yoga Ireland, studying with some of the most gifted and skilled Certified Anusara Yoga Teachers: Noah Maze, Betsey Downing and Deb Neubauer. Also, in 2011, I completed a teacher training course in Kids & Family Yoga with Rainbow Kids Yoga. Since 2013 I have been practicing Mindfulness in the tradition of Zen Master Thich Nhat Hanh and regularly attend retreats in Plum Village, his practice centre in the south of France. I find my Mindfulness practice to be the perfect companion to my Yoga practice: both bring me back into the present moment and remind me of the many blessings I have in life. I find that regular practice of Yoga and Mindfulness meditation brings me peace, keeps my body and mind open and my spirit nourished. I have been teaching since 2006 as a way of sharing the gift of yoga with others. My classes incorporate Breathwork (Pranayama), Yoga Postures (Asana) & Relaxation (Yoga Nidra) with a strong focus on Mindfulness. My teaching is influenced by the seasons, the lunar cycle and our traditional Celtic festivals. I have taught Yoga to a wide variety of ages and levels of mobility: I passionately believe that Yoga can be of huge benefit to everyone and can be made accessible to anyone. I continue to attend Yoga classes, workshops and teacher trainings on a regular basis to deepen and extend my knowledge and understanding of Yoga and Mindfulness. I have studied with many amazing teachers including Jason Crandell, James Higgins, Matthew Sweeney, Martin Kirk, Bridget Woods-Kramer, Desiree Rumbaugh and Donna Farhi. My practice & teaching have been influenced by these and many other teachers, and incorporate elements of many different styles of Yoga.